If there was anybody who was disappointed with Bernabe Concepcion’s second round knockout at the hands of WBO featherweight champion Juan Manuel “Juanma” Lopez in a two round firefight in Puerto Rico, it has to be pound-for-pound king and “Fighter of the Decade” Manny Pacquiao. After entering the dressing room of former two-time world light flyweight champion Brian Viloria before he entered the ring for his ten round comeback fight against Omar Soto in Solar Sports “Boxing at the Bay” series at the Ynares Sports Center late Saturday, Pacquiao spoke to insidesports.ph, Standard Today and Viva Sports about the Puerto Rico blockbuster fight card which was telecast on Sunday morning by the giant broadcast network ABS-CBN over its pre-eminent Channel 2. 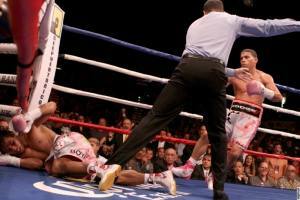 In the end it was clear that Concepcion didn’t follow Pacquiao’s instructions and appeared bent on trying to win the fight with one lucky haymaker but except for the dying seconds of the opening round when he dropped Lopez with a looping left hook Concepcion was wide open and was picked apart by the champion in suffering a 2nd round knockout.